MORE AND MORE, retail is migrating out of the streets and onto the Internet. Whereas once you had to plan your Saturday shopping around store times and parking meters, you can now take care of almost everything from your mobile phone. Convenience is the Watchword. Convenience is King. But what about luxury brands? Two of the defining elements in luxury are its exclusivity and its rarity. If you want a Hermes scarf or a Dior handbag, you must seek it out, join a waiting list, and pay dearly. In fact, the exclusivity is what allows luxury brands to maintain high prices. If anyone could buy a Chanel tailleur online at a bargain price, who would pay $19,000 for the same one at the 57th Street flagship? However, e-commerce and omni-channel retail are pronouncedly here and poised to take over the world. Investments in e-commerce by retailers and venture capitalists are ballooning around the world – examples like China’s Alibaba and Germany’s Rocket show how much investor confidence there is as both IPOs were hugely oversubscribed but not, according to the experts, overvalued. According to Modern Distribution Management, over 70% of all US distributors planned to invest this year in e-commerce. It seems that it is the future. And it seems the future is here. The argument would seem to be, if everything is going online, why is luxury not part of this migration? What is about luxury that makes them drag their heels and say things like “we don’t like it”? Can anyone afford not to “like” it anymore? In an article in Business Week whose opinion was less than veiled (“Luxury Brands Are Stupid to Snub the Internet”, April 3, 2014), a case was made for convenience (again). The overwhelming thrust of the article was that rich people are too busy to buy luxury goods in stores. They need to be able to buy online. Just like buying a sack of potatoes. Who has time any more to buy sacks of potatoes? They allege that luxury brands were “losing” sales to competitors who are online. They say that 90% of this “$300 billion industry” is sold in stores, viewing it as a lost opportunity. The business model for selling luxury goods online is not quite that easy. Luxury brands, first of all, do not lose anything to competitors. Brand loyalty is earned and maintained carefully and the true luxury consumer does not compare apples to Gucci or oranges to Mugler. That is one. It would alienate a large cross-section of the clientele by eliminating rarity and exclusivity. It would force luxury brands into more direct competition with each other, thus devaluing the “unique” quality of the brands. It could possibly do the unthinkable: drive DOWN prices and therefore eroding the luxury sheen. The “affordable luxury” gambit that Mauboussin has played has been a winner in terms of sales, but otherwise very costly to the brand. No longer regarded as “true l uxury”, Mauboussin continued to invest in digital and physical retail at the same rate, betting that volumes will make up for margins lost. But the New York flagship had cost them more than €20 million when they had to close it in June this year. Clearly the money in luxury is in the margins. 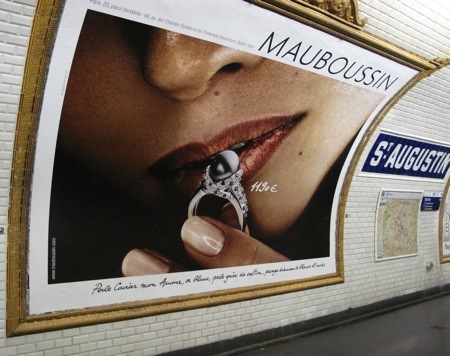 Mauboussin, despite these dismal figures, is considered by some as a success. The online sales, an area not yet mastered by many luxury jewelers, allow the brand to claim back a little of the lost margin. But the luxury tag is gone. Kapferer may be old-school in this regard, but his caution to luxury brands against the pitfalls of e-commerce makes sense. The allure of “convenience” is very dangerous to luxury. His should not be a call to stay clear of online shops, but rather a warning to make sure you pay attention to the minutia of luxury sales. It should not, in other words, ever be the same as buying potatoes. What is the Golden Mean in all this? There would seem to be many ways in which a luxury retailer could preserve the traditions and rites surrounding luxury while still claiming his share of the e-commerce gold mine. Wait lists, exclusive buyers’ clubs, diversified online ranges, or personalized customer service could distinguish luxury from mass market online. E-commerce, no matter what we think about it, is the current stage of retail evolution, and no brand, luxury or otherwise, can afford to ignore it. For a luxury brand, the choice to go into digital retail is not something to take lightly. Like its consumers, it must be treated with great respect. This entry was posted in Branding and Communications and tagged branding, brands, digital retail, e-commerce, Kapferer, luxury, online, sales, traditions. Bookmark the permalink.